How Can I Join The Grange? Thank you for your interest in the Grange. Approximately 160,000 people are members of the Grange Organization as a whole, in more than 2,100 local and state chapters nationwide. In the State of Connecticut, there are over 40 communites with a Community (Subordinate / Local) Grange. The Grange offers three types of membership. Membership in a local chapter, an associate membership at the National Level, and an E-Membership at the National Level. Membership will help the Grange continue programs that fight for communities in Congress and in our state legislatures; support local farms; preserve heirloom skills and crafts; provide local activities for children and young adults and promote volunteer community service projects across the state and the nation. and one will be mailed to you shortly. 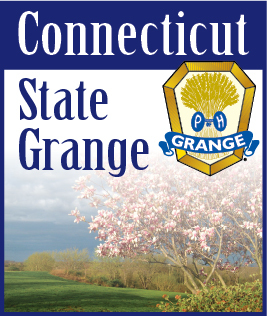 Thank you for your interest in joining the Grange in Connecticut!